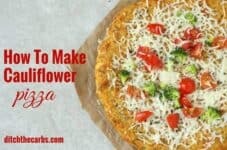 Never made cauliflower pizza?? Scroll below to watch the quick video how to make your versy first cauliflower pizza. Low carb, grain free, gluten free and super healthy. Cauliflower Pizza – who knew? I bet you didn’t know just how versatile cauliflower was until you went low carb. 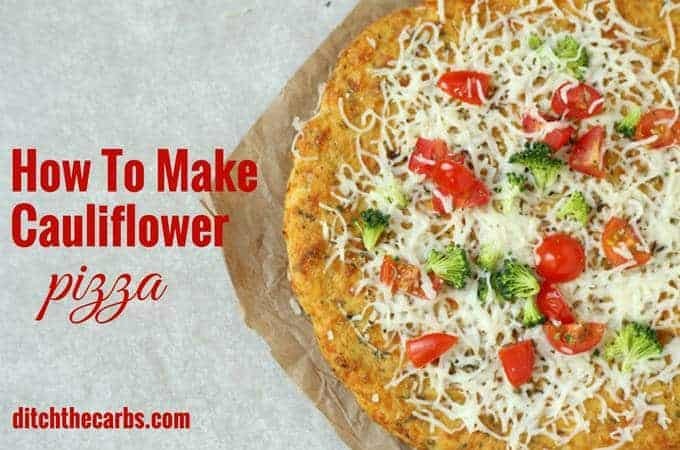 This veggie powered cauliflower pizza is a fabulous low carb alternative to regular pizza. 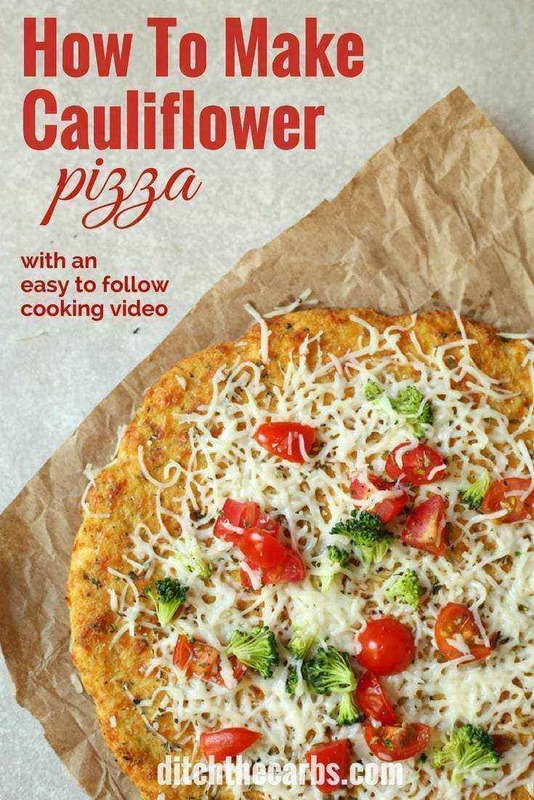 The quick video shows you how to make cauliflower pizza, step by step, and how to load it up with nutritious toppings. The taste of cauliflower pizza truly depends on which cheese you use, the addition of any herbs and spices to the base, and which toppings you place on top. If cauliflower pizza isn’t for you, try Fat Head Pizza, which is incredibly popular. Take a look at what a regular pizza meal might look like in terms of carbs. And be truthful, do you have just one or two slices? And don’t think vegetarian pizzas are any healthier, in fact Pizza Hut Vege Supreme and Tropical Veg pizza were amongst the worst (see below). Keep an eye out for the sides, chips, breaded onion rings, sticky spare ribs (pork spare ribs 43.6g carbs/serve (40.9g sugar) ) soda, ice cream, garlic bread, extra cheese all add up to a carb fest, and all the wheat, sugars, grains and unhealthy fats that go into them. Serve the cauliflower pizza with a side salad loaded with greens and healthy oils and you have a wonderful nutritious meal. Cauliflower pizza is high in protein and healthy fats, low in carbs, gluten free and a good source of Vit C, Vit K, folate, magnesium, B6 and potassium, just to name a few. Cauliflower pizza is a sneaky way to get more veggies into your children. Remember to add plenty of cheese to make it tasty and mask that 'cauliflower' flavour. Cut the cauliflower into smaller florets and blitz the cauliflower using a food processor until quite fine, but do not puree. Steam them until soft, or microwave for 5 minutes. Place the cooked, soft cauliflower onto a clean tea towel. Twist to remove all the liquid. If not enough liquid is removed, the pizza base will not crisp. Place the drained, cooked cauliflower in a large mixing bowl and add the egg, seasoning, herbs and grated cheese. Mix well until a ball forms. Prepare a baking tray lined with a non stick sheet or baking paper. Do not use a pizza stone as it will probably stick and not lift off easily. Place the ball of cauliflower 'dough' onto the baking sheet and press out into a round pizza shape. Spray the top with some olive oil to help it crisp, then bake at 180C/350F for 15 minutes or until golden. Add the toppings, cover with more cheese and cook until the cheese is melted and bubbling.. This is not like regular pizza dough, think of it as a different approach. All ovens vary so check frequently and adjust accordingly. Even if the crust falls apart when serving, it tastes darn good and just eat it with a knife and fork. Can also be baked in a cake tin or baking dish. Base can be flipped to make it more crispy on both sides. All meat toppings need to be cooked before adding as we just heat the base for a small time to allow the cheese to melt. Hi, dont understand so high calorie. One egg is 80, 100 g mozzarella max 400 and you got more then 1400 kcal fort this (6 slices x 236 kcal each). WOW!!! I made this with two big cauliflower. After steaming it I just winged the rest of it. Put 5 eggs, plenty of cheese, herbs and coconut flour to firm it up. Got 7 small pizzas. Hubby couldnt stop raving about it and was so surprised that only one filled him up(usually has a started size pizza). I managed to eat only half cos it filled me up. Thanks Libby, although this was labor intensive, I was happy it yielded 7. Got the rest frozen for another day. So you made 7 pizzas from this recipe? Hey Libby I’m wondering as I absolutely love this recipe it can be a little time consuming.is it possibly to make a few bases and freeze them or even make the day before and refrigerate to use the next day ? Awesome idea! I would freeze them after they have been cooked and cooled. You could place sheets of baking paper/parchment between thems o they are easier to remove 1 base and reheat. Thank you for the clear instructions (and pics). Can I substitute wheat flour with almond flour as my wife is gluten intolerant? The way you gave instructions was too easy for me. I had cooked it and was awesome. Thank you Angela for this, I am glad my instructions are clear and can be followed easily. Could you please specify how many grams or cups of chopped cauliflower equals a “medium cauliflower “? I’d greatly appreciate it. Thanks! Do you have any pizza base recipes that don’t need an egg added or recommended an alternative to egg? My son is allergic to eggs but loves pizza. LOVE THIS!!! And here I was skeptical of cauliflower *anything*. Honestly it was so delicious, did not taste like cauliflower. Absolutely recommend this. I topped with just salami and mushrooms. Thanks for sharing this recipe and this website, it’s now my “go to” site for low or no carb recipes. If you add about 1/4 Cup-ish almond meal to the mix, it helps it stay together a little better when cooked & if you cut the slices a bit smaller than usual, you can usually pick it up as you would a standard pizza slice. It’s in the oven!! Can’t wait to try it! I’ve seen pics of these pizzas, and love the idea of the whole thing! I bet it’ll be even better than a “regular” pizza! 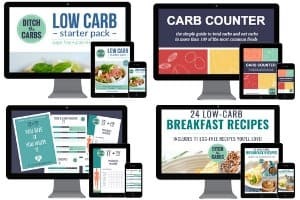 I’m hopping back on the low carb bandwagon and I am so glad I found your blog! I have one question though, when you refer to capsicums do you mean the large green, red, yellow, and orange peppers that are usually called bell peppers in the US? Am loving this page so much, eye opening indeed!!! Beautiful images and graphics! And, wow! Pork ribs can really have 40+ carb grams?!?! Violated. Busted Terri! Yeah looking at those pizza nutritional values (which by the way, are hard to find on their websites – wonder why?) makes for interesting reading. It’s the sides and sodas that are the killer, and the fries. Not only the carbs but all the processed ‘stuff’ (nice technical term there) that goes into it. It’s so much easier to say no to these junk foods once we understand just how awful they can be, or at least, make better choices. This is such a great pizza and I love your point ” Even if the crust falls apart when serving, it tastes darn good and just eat it with a knife and fork.” …because that is so true. Just enjoy great tasting low carb food.